Is your computer running slow? Did you just download a virus? 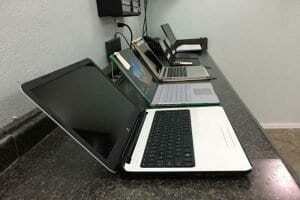 Is your laptop screen broken or discolored? If you have a frustrating computer software or hardware issue that’s preventing you from getting tasks done, don’t worry. We’ve seen it all before and we’re here to help. Have another issue that’s not listed here? Let us know by describing your computer problem here. 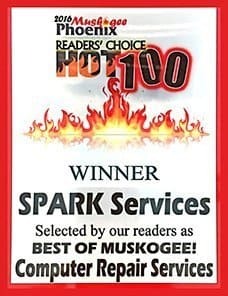 Our technicians at SPARK Services in Muskogee have over 25 combined years of computer repair experience. Our shop has diagnosed, repaired, and restored over 500 devices back to full working order in just 2015 alone! 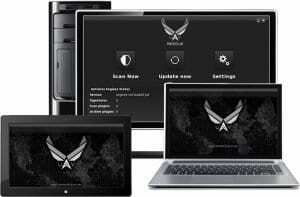 We work on all major makes and models of desktops and laptops including major brands such as Apple, Dell, HP, Lenovo, and Toshiba. Have a broken or cracked iPhone or Android screen? Is your smartphone not turning on? Bring your mobile device to our Muskogee shop today for repair services. We can replace most smartphone screens on the spot. Call or contact us today to check for screen availability. If your computer problem on your home or work Mac or PC is preventing you from getting things done, start by submitting your computer issue below. We’ll get back to you within 1 business day or sooner with a solution and/or update regarding the issue. 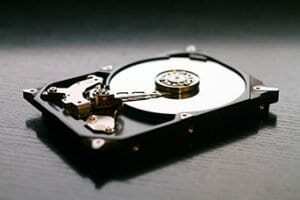 Depending on the matter, we may need to take a look at your device on-site at our Muskogee computer shop.